This entry was posted by Gareth Moore on November 4, 2009, and is filed under CalcuDoku, Toroidal. Follow any responses to this post through RSS 2.0. You can leave a response or trackback from your own site. Just wanted to make something clear: When I say, “This puzzle is too easy, make them harder.” … That doesn’t always translate to “Make it a toroidal”. 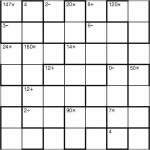 Something you might try: I found a couple of “Mystery KenKen” online where you get the cage number but not the math operator. The 9×9 was very interesting. That’s actually really funny, about the toroidal puzzles! Truth be told I haven’t yet made any missing operator Calcudoku (i.e. KenKen, TM) but it is definitely on my to-do list! Of course it’s not really any more instrinsically complex than regular Calcudoku – you’re just expanding the search space for each clue a little (or a lot! ).